Building information modelling (BIM) is increasingly integrated into the procedures for the design and operation of buildings. Since the UK government’s 2011 Construction Strategy spurred on the implementation of BIM working practices, awareness and the processes have permeated into many of the larger UK building services consultants, contractors and operators. This article will consider the evolution of BIM and the standardisation that is enabling more uniform adoption, which will further increase its effectiveness. The work undertaken at the turn of the century by the UK Department of Trade and Industry’s (DTI’s) Avanti information, communications and technology project1 devised approaches for collaborative working that laid the foundation for the UK BIM processes of today. However, the concept of BIM is not based on a fixed construct, and various aspects of ‘building information modelling’ have been commonplace – within the construction sector and other manufacturing industries – for many years. Time savings: BIM has the potential to result in time savings at both the construction and operational stages of the building’s life-cycle, through collaboration and information availability. 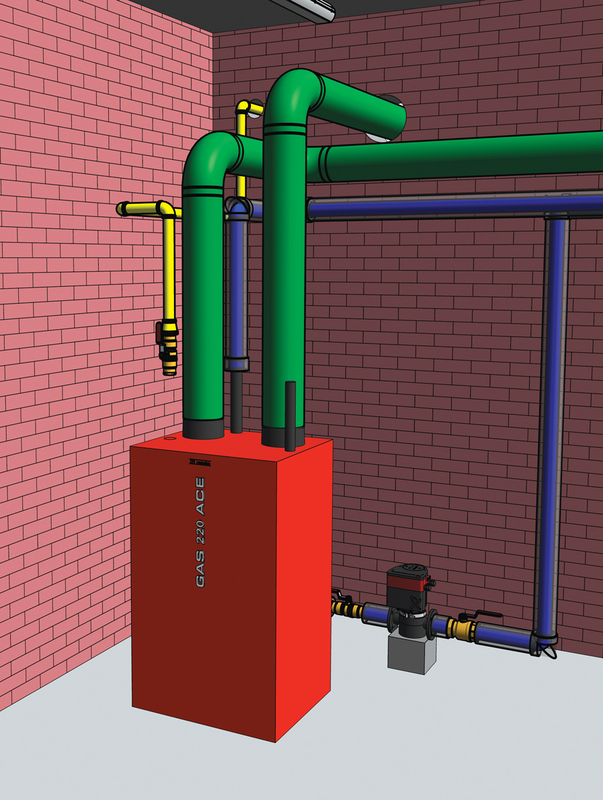 Access to consistent, reliable data supports the use of offsite prefabricated heating equipment, such as bespoke prefabricated modules for multiple boiler installations – reducing onsite time. Materials savings: There is potential for materials savings across the building life-cycle, by optimising the materials required and reducing waste through improved holistic understanding of current and future requirements. Cost savings: Cost-saving opportunities arise, for example, from fewer changes, better clash detection, and improved resolution in facilities management and maintenance. 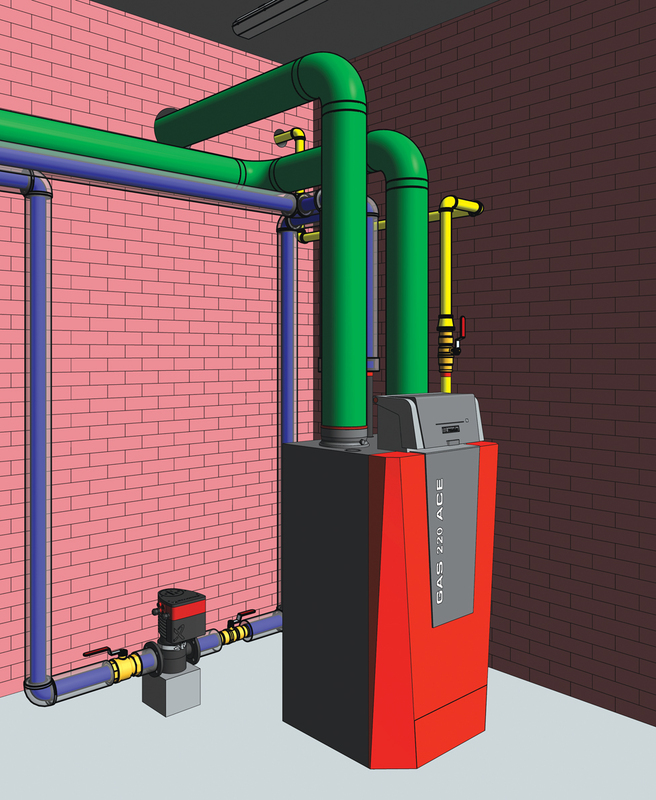 For ongoing operation and refurbishment, BIM can provide detailed, linked, up-to-date data that may be used to define offsite prefabricated equipment – such as bespoke pre-assembled multiple boiler installations – reducing onsite labour and lowering cost significantly. Risk reduction: Increased accuracy of information about a project or building – and improved visibility about associated costs, delivery timeline and risks – potentially reduce the variability of costs and time required for delivery and operation. Improved asset utilisation: Enhanced information – both pre- and post-construction – that can potentially be used more productively over its lifetime, such as: better space utilisation planning; faster maintenance and refurbishment, through use of an asset information model; and faster BIM-enabled response to incidents. Early visualisation can also help flag issues such as restricted access to a plantroom or limited access to equipment, allowing early plantroom relocation or size alteration as plant selections become better defined. Improved quality: Better oversight in design and construction can deliver increased quality for end users, such as 3D and 4D visualisation, which can lead to improved building and plant layout, or simply produce a more appropriate built environment. Early engagement at the design stage can have a positive impact on the building outcome. For example, manufacturers – with their specialist knowledge and expertise – can advise on where best the HVAC equipment can sit within an overall design. Improved reputation: The insight and operational effectiveness BIM gives can generate enhanced standing for construction clients, asset owners and the supply chains, by improving the experience of those associated with building and service delivery. The Heathrow Terminal 5 development (2002-08) is widely considered to be one of the key collaborative teamworking projects that set the pace for BIM, with a 4D planning tool linking CAD data to schedules, helping to identify potential clashes between contractors – which, it was claimed,4 saved £2.5m in the first nine months of use. It was around that time that BIM terminology started to gain popular use. 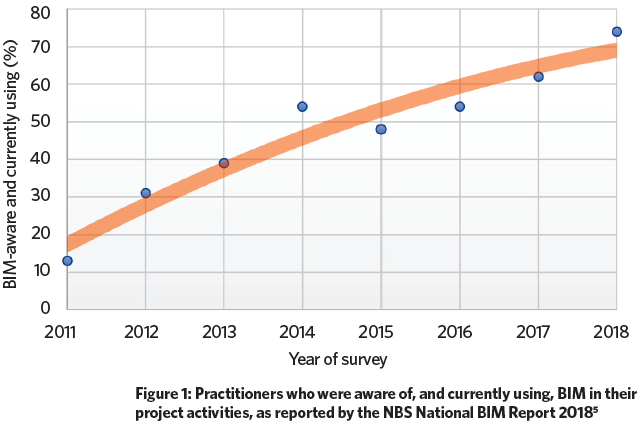 Recent research (Figure 1) indicates that the active uptake of BIM in the building professions has steadily increased since 2011, with more than 70% of respondents to the 2018 NBS National BIM Report5 saying that they were BIM-aware and applying the processes in their project activities. However, what individuals recognise as ‘BIM’ will vary greatly – from a 3D visualisation (regardless of the ‘richness’ of the embedded or associated parameters), right the way through to intelligently linked, cloud-based building models that draw on connected distributed information for optimisation of integrated multidisciplinary building design, operation and maintenance. The expectations of clients and practitioners can also vary widely. Around the time of the development of the UK government’s milestone 2011 Construction Strategy,6 the March 2011 Strategy Paper for the Government Construction Client Group, from the BIM Industry Working Group, was fundamental to corralling the expectations in terms of BIM ‘maturity levels’. The maturity levels (below) have subsequently provided a more clearly defined interpretation for the degrees of integration, and the aspects of BIM and associated information technologies that should be included in projects. The subsequent Construction Strategy 2016-20207 has maintained the focus, with UK government projects currently expected to be delivered with maturity level 2 BIM. Level 0 – use of 2D CAD drafting with paper-based or electronic print information and data exchange. This was the typical state of the industry in 2011 (and in many cases, still is). Level 1 – use of a mixture of 2D or 3D CAD backed by a common data environment for electronic sharing of drawings and data, with a standardised data structure and format. The key standard is BS 1192:2007 + A2:2016. Not all project team members may be sharing models. Level 2 – collaborative working across disciplines, with all using managed 3D BIM environments, integrated but not necessarily directly shared and likely to be created in separate discipline-based modelling environments. These models join together to form a federated model, but still maintain their independent integrity. They are likely to include linked cost and scheduling information. This is supported by a plethora of standards, most significantly BS1192:2007 + A2:2016, BS1192:4, PAS1192:2, 3 and 5 and BS8536-1 and 2. Level 3 – fully collaborative working across all disciplines using a single, shared project model held centrally and accessible to all to modify and share data. Work in progress – unapproved information for each organisational role, such as building services designer and architect. Shared – information that has been approved for sharing with other organisations for use as reference material for their own design development. Published documentation – information, such as coordination and validated design outputs, for use by the total project team, including information suitable for tender or construction. Archive – stores a record of the project history, including all transaction and change orders. As well as consistent digital file organisation and drawing conventions – typically as defined in BS 1192 – BIM application requires standardised formatting, typing and granularity for shared information. The depth and detail of the information are discussed in PAS 1192:2. Although these will be project- and component-dependent, the terms ‘level of (model) information (LOI)’ for non-graphical information and ‘level of (model) detail (LOD)’ for graphical information are used to give some reference to information providers at points in the project. For instance, Figure 2 illustrates a simple example of practical difference between a gas-fired hot-water boiler at LOD 3 and LOD 5. The associated LOI 3 is likely to provide a simple requirement of the basic heating load requirement (with approximate physical parameters) for the boiler, and at LOI 5 there would be full information that is product- and manufacturer-specific. Although some indicative guides link LOI and LOD to project stages, the current practice is to define these on a project-by-project basis. The expected minimum levels for each work stage are defined for each project in the BIM Master Information Delivery Plan – which schedules the delivery of information during the project – as described in PAS 1192-2. For manufacturers and suppliers, the information required will be dependent on the requirements of the specific project. To ease the process of servicing multiple and disparate information requests throughout the whole project life-cycle, a number of information ‘schema’ have been developed to standardise the digital provision of data from manufacturers and suppliers. For example, the product data template (PDT) – as developed by a cross-industry group led by CIBSE – is a standard ‘questionnaire’ for each equipment type. Each PDT aims to anticipate the information sought by every party – from specification through operations to decommissioning and replacement. The information is produced just once for a manufacturer’s product and will then feed many BIM needs, including consultant, contractor, COBie (post-construction asset information), commissioning engineer and building operator. PDTs are in a universal XML format – and may be viewed as Excel spreadsheets – so are readable by both humans and digital systems, and usable with all BIM platforms. PDTs are available for many building systems components (as listed at, and freely available from, bimhawk.co.uk). When a manufacturer completes a PDT, it becomes a product data sheet (PDS) – a ‘digital’ description of the product that can be freely distributed. This standard format enables users to automate data operations that extract as much, or as little, information as is needed. Standards have continued to develop in the UK’s 1192 series, as they have also evolved in European and international standards documents. The release is imminent of ISO 19650 Organization of information about construction works – Information management using building information modelling – Part 1: Concepts and principles and Part 2: Delivery phase of the assets, together with a UK National Annex to Part 2 and transitional guidance to move across from the current UK standards. Further international standards are in development to replace the remaining PAS 1192 documents (PAS 1192 – 3, 5 and 6). The change in standards will require a number of fairly minor changes in the way BIM is implemented in the UK. The main principles remain, but some of the descriptors have altered to provide a more universally understood ‘jargon’. The integration of BIM is no longer a minority activity, and will simply become a normal part of the building construction and building operation process – as have CAD and CDM over the past quarter-century. However, with the growth in distributed digital information services, it is likely that common data environments will become cheaper and more accessible, allowing accelerated integration of BIM into both large and small enterprises. A huge amount of material is available on the web. Good places to start include the Scottish Futures Trust website and BIMTalk. The collection of relevant current UK BIM standards can be freely downloaded here. The Construction Research Programme – Project Showcase, UK Department of Trade and Industry, 2007. BIM Level 2 Benefits Measurement – accessed 21 September 2018. PAS 1192-6:2018 Specification for collaborative sharing and use of structured Health and Safety information using BIM, BSI 2018.
www.arup.com/projects/heathrow-terminal-5 – accessed 21 September 2018. The National BIM Report 2018, NBS – accessed 21 September 2018. Government Construction Strategy, UK Cabinet Office, May 2011. Government Construction Strategy 2016-20, UK Infrastructure and Projects Authority, March 2016. PAS 1192-2:2013 Specification for information management for the capital/delivery phase of construction projects using building information modelling, BSI 2013.